Good afternoon, kittens! This weekend was filled with Hitchcock movies, turning plums into plum cakes, and a fair bit of sewing. After a summer of illness and calamity, we're reveling in the change of seasons. Well, metaphorically anyhow. It's still decidedly summer around here. To quote Stella from Rear Window, "You'd think the rain would've cooled things down. All it did was make the heat wet." 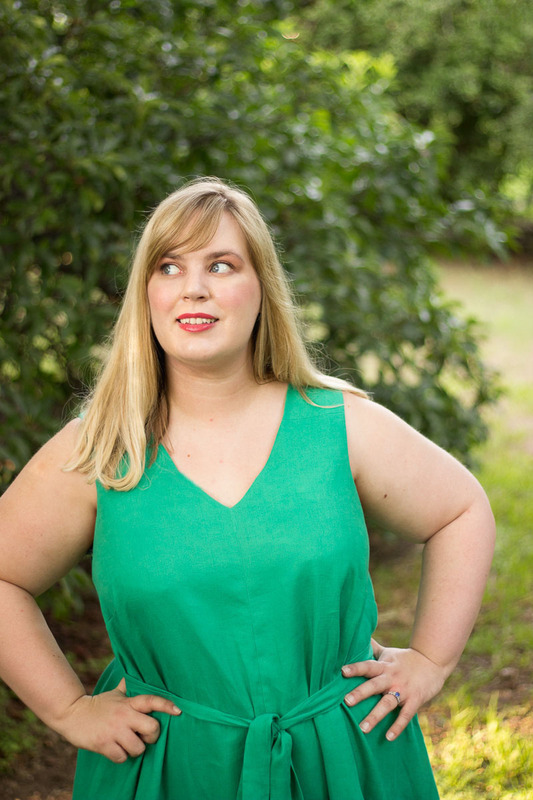 My fall sewing list is as long as my arm, but each piece is more impractical than the last. Stevie Nicks dresses and pink wool coats are exciting, sure, but I can't wear them until November! So, I'm instituting a rule: for every impractical garment I sew, the next piece needs to be wearable immediately. After giving Butterick 5878 a spin (a swishy, long-sleeved Stevie dress yet to be blogged), it was time for something practical. 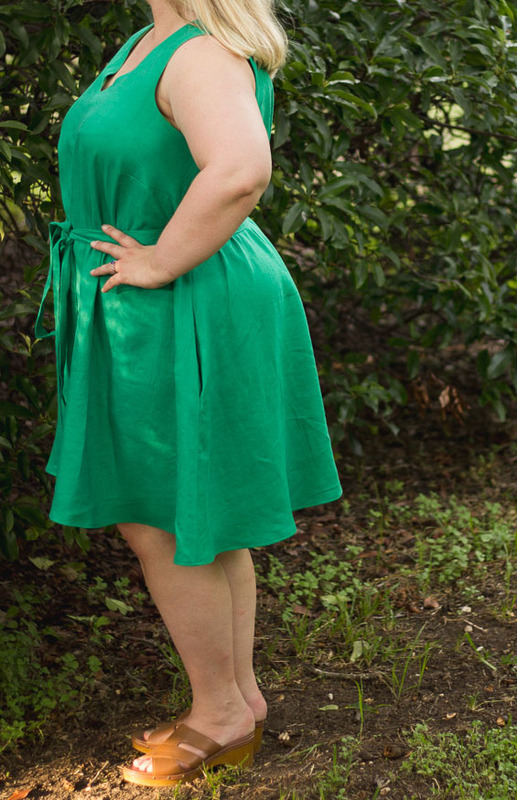 Namely, that green linen tent dress I mused over a few weeks ago. 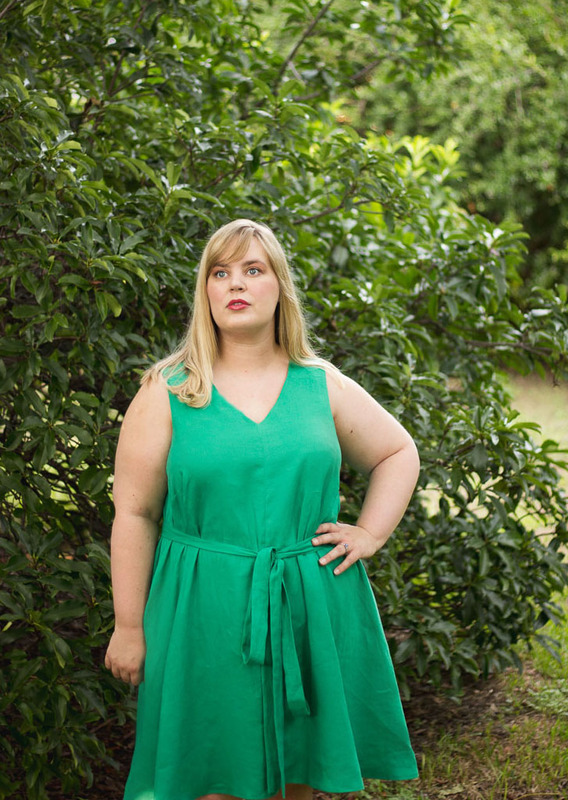 This is the Papercut Sway Dress again, made up in a medium-weight emerald green linen from Mood Fabrics. When this fabric first arrived, it was stiff with sizing and scratchy against the skin. Rather dreadful prospects for a garment. However, I took the brilliant Carolyn's advice about sewing with linen and washed it not once, but three times. This fully relaxed the linen fibers, washed away the sizing, and produced a soft, draping dream of a fabric. This method also protects somewhat against the worst of linen's wrinkles. There are still enough for character, of course, but I can definitely tell a difference between using this method and just single pre-washing. I can wear this dress all day and not look a complete mess, two hours in. I ordered two yards of this linen, which isn't quite enough for the pattern. Some creative cutting and adding a front yoke as a "design detail" sorted things out. I also changed a few things from my first version. The Full Bust Adjustment, with its angled dart at the side seam, remains, as does the fantastic all-in-one facing to finish the neckline and armscye. However, I sloped the hemline for a subtle high-low effect, giving the dress a little more swish. 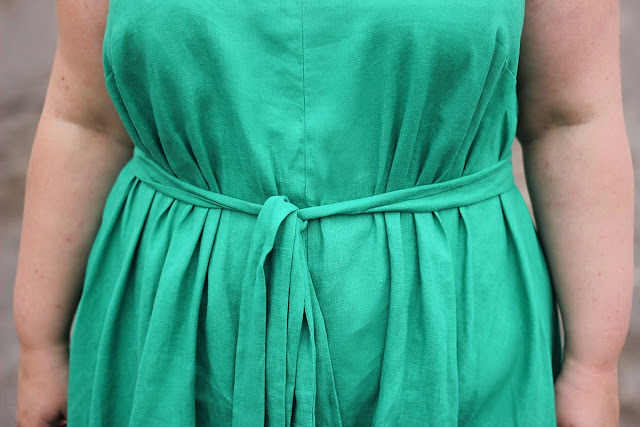 The waist tie is also twice as wide, which helps cinch in the heavier fabric. 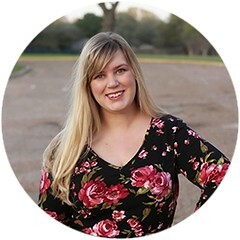 If you'd like more pattern construction details, check out my first Sway Dress review, which goes in depth about that process. Let's talk about actually sewing with linen though, shall we? Linen is one of my favorite substrates to wear. Perhaps I've watched Romancing the Stone or The African Queen one too many times, but wearing linen makes me feel both glamorous and ready to swing from a vine, should the situation call for it. However, it can be a bear to sew with. The loose weave grows as you handle the fabric, causing curves to stretch and seams to warp. It will also relax around your body, with wear, so fitted garments require planning ahead for bagging out and drooping. There's a fantastic article from Threads on sewing with linen, including guidance about seam finishes, linings, and pre-washing. Cobbling together advice from that article and a few others, I changed my process for better accommodate linen's idiosyncrasies. The facing for this dress is made with a coordinating green bamboo voile, which has a hand and structure like silk organza. That gives more support where the linen needs it: around the curves of the neckline and armscyes, plus along the shoulder seam, which carries most of the dress's weight. There's fusible interfacing around the neckline to stabilize it and twill tape in the shoulder seam itself, for further support. I also stay-stitched every possible curve, immediately after cutting my pattern pieces out, to prevent warp. In the Sway Dress instructions, we're told to let the dress hang for twenty-four hours, before hemming. This lets the bias parts of the skirt drop with gravity, so the hem won't be a dodgy, up-and-down affair after a day of wearing. With linen, this step is even more important. I let it hang for two whole days, to ensure everything dropped fully. This fabric has such a loose weave that the bias portions dropped over six inches at each side seam. Yikes! This is how that slight high-low hem came into being. I figured that I was going to spend an eon evening the hem anyhow, so why not make it more interesting? Thank heavens for dress forms, y'all. Voila! 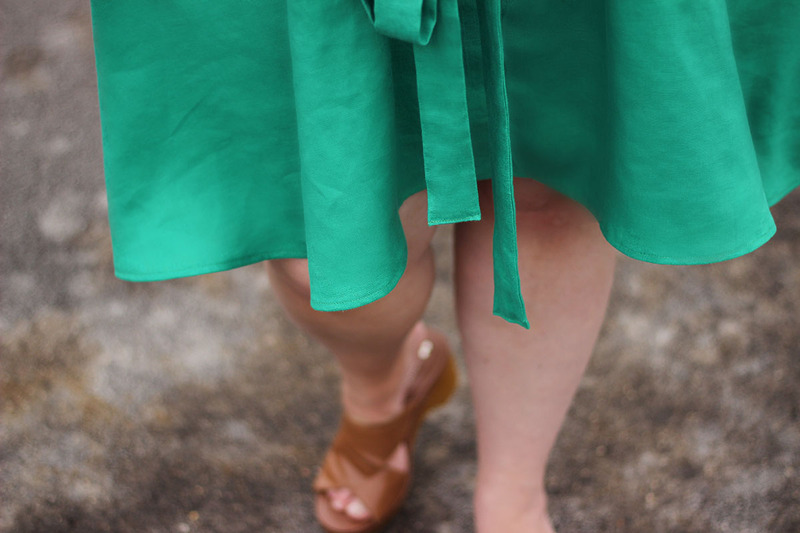 A totally practical emerald green tent dress. This really is perfect for end-of-summer Texas wardrobe blues. Sure, I'd rather be hauling out sweaters and tights, but this billowy, bright dress makes me smile every time I wear it. The extra wide waist tie mimics a fit-and-flare silhouette well, but the linen skims every curve and dances around the body. It's ideal for running errands on muggy days and dressing up for casual summer dates. Also, if I could source it in every substrate, I would probably wear this color every day. Emerald cashmere coat, I will have you, eventually! Now, I'm going to plot my next impractical project and possibly bake a loaf of challah. I've been re-watching old seasons of The Great British Bake Off lately and they're giving me delusions of kitchen grandeur. We've had way too many clafoutis-related emergency grocery store trips, lately. Sam even had to talk me out of making île flottante at midnight, earlier this week. 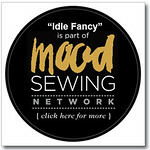 Maybe a bit of frivolous sewing will curb such whimsy elsewhere? One can hope. Disclaimer: The fabric for this project was provided to me free of charge, as part of my membership in the Mood Sewing Network. However, I picked it out and all opinions are my own.